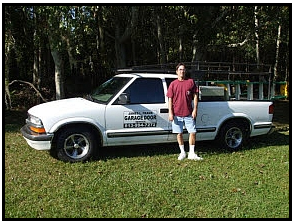 We have been the garage door repair experts in Tampa for over 20 years! We offer same day service to fix your garage door no matter how large or small your repairs may be. My mission is to give you quick, quality repair of your garage door at a very reasonable price. I handle all brands of garage doors and garage door openers. I am a small local business owner in the Tampa Bay area and do not have all of the cost associated with the big chains. This allows me to have prices much lower than all of my competition here in Tampa. In addition, I can usually give you same day service which is the fastest in town. Professionalism in everything I do is just one other thing that makes me stand out from some of the other garage door repair services. We only use the highest quality parts that are going to last you a very long time so that you don't have repair needs any time soon. Call Us Now for Same Day Service! The areas we service are: Wesley Chapel, San Antonio, Zephyrhills, Tampa, New Tampa, Lutz, Land O Lakes, Odessa, Brandon and Seffner.